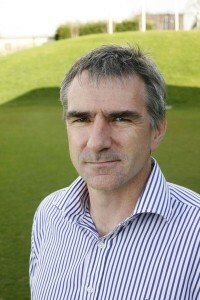 Steve James is to leave the Telegraph, where he has been the Sunday title’s rugby correspondent for almost three years. James announced his departure via Twitter last Friday morning. “Utterly shocked and devastated to be told that, due to cuts, I will no longer have a job at the Telegraph,” he said. He has also updated his Twitter status to describe himself as “Rugby union correspondent for the Sunday Telegraph but not for much longer”. It is understood that James is not the only long-standing Telegraph writer to lose their position, though no confirmation has yet been received of other departures. James, 49, began writing on rugby for the Sunday Telegraph in 1999 while he was still playing cricket for Glamorgan, where in a 20-year professional career he captained the county for three seasons and won two England caps. On retiring from cricket, James took up a contract with the Telegraph writing on both rugby and cricket. In 2008, he was appointed cricket columnist for the Sunday Telegraph to replace Mike Atherton. He has written several books, including two for the Wales and Lions captain, Sam Warburton. Social media was full of supportive comments from erstwhile colleagues and friends from press boxes around the country, including from a couple of former cricketers-turned-journalists who have recent experience of being “let go”. James’s announcement of his own departure comes just a couple of weeks after the latest “signing” at the Telegraph, which last month announced that Ryan Giggs had been signed “as an expert columnist to bring his unique insight to its unrivalled football coverage”, where he would be “joining The Telegraph and our unbeatable team of writers and reporters”. Tickets to attend The National Lottery-sponsored SJA British Sports Awards are on sale now to members of the public, and with massive discounts on prices for SJA members.